Subway: A,C, E, 1 to Canal St. Please arrive as you would for any other meeting and look for us inside. If you have any questions, call Lou anytime at (347) 886-9784 (347) 886-9784. As always, please allow me to thank everyone for your continued support not only for your dues but by coming out to join us at the monthly meetings. I urge you to spread the word about our noble hobby and to get involved with club activities, as I always say, "The club is only as successful in proportion to the involvement of its members", so, I encourage you to get involved! As you know your annual dues are used to supportall of our club activities such as, the monthly tobacco tastings,our summer picnic, our web site and emailings,and much more. WE NEED & APPRECIATE YOUR SUPPORT!!! It's that time of year again! Please Join or Renew your membership now! When you renew, we'd appreciate it if you could please take a moment to update your personal information, such as email, telephone number and address.We're going to have a great 2015! Please make every effort to join us at our Monthly Meetings! Please remember, my goal as your President, as always, is to do what is in the best interest for the club. I try to remember to give opportunity at every meeting, by opening the floor for discussion, your chance to let me know what you like or don't like and to make suggestions to make our club a more enjoyable experience. We all want our Club to thrive and prosper. Members and Friends, I'm doing my very best to continue to generate interest in our Club as well as our hobby, and to maintain a thriving and encouraging environment for our Club, so I hope that you will all try your best to help me out to that end. As I always say, "the club is only as successful in proportion to the involvement of its members", so please get involved. I thank you all for your continued support and interest. I realize that we are all busy folks so I want you to know that I appreciate your time in coming out to our monthly meetings and to our impromptu extra events when scheduled from time to time. It is not easy to make the time and break away from our busy lives, I realize that, but consider the great times we have when we do get together, I know I enjoy myself thoroughly and wished it could happen more often! Our Club BBQ/Picnic, for example, was a great event, enjoyed by all who came and I hope that more of you will come out to join us next time, as well as to any of our impromptu events such as the "Smoke on the Water" night! I assure you that you will have a great time! I encourage you to please join us at our March Meeting as we... enjoy a Brand New Look to our meeting home! And, who knows what surprise tobacco blends await you to sample...! Don't miss it! 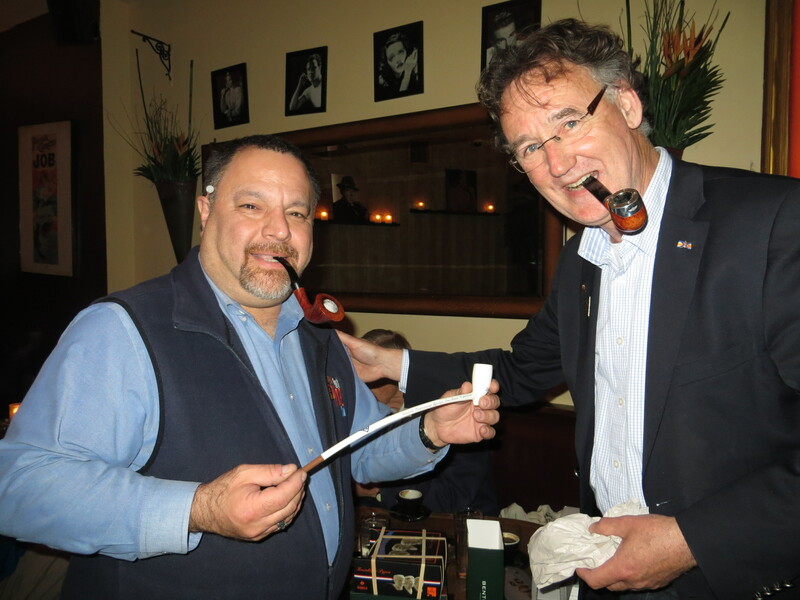 The New York Pipe Club's Celebration of IPSD was a complete success! We had a great day at Nat Sherman for our 8th Annual IPSD Celebration and a huge thanks go out once again to our friends at Nat Sherman who made it possible. It was a privilege to be invited to relax and enjoy our pipes in the Johnson Club Room on the lower level of Nat Sherman. Close to 25 of us gathered for the event. Club member and Store Liaison, Chris McGrath was our host for the day and he debuted a special tobacco for the event called, Nat Sherman NS 85, to commemorate the 85th anniversary of Nat Sherman. The blend, which is delicious BTW, is comprised of over 25% - 30% perique, but you'd never know as it mixes nicely with the virginia and latakia components (Chris and Dmitiri can correct me if I left out any other ingredients, like Kentucky?). You should definitely give this blend a try! It's always great when we, as a Club, have opportunity to get together and we had a fun filled day that consisted of special store discounts, the purchase of some beautiful new pipes, some fine tobaccos and a few Raffle prizes that, for the winners, meant a few tins of vintage Murray's era Dunhill Tobacco (donated by Dave Wrubel and Mr. Vig), a full sleeve of current version Bell's Three Nuns (John Semel) and a couple of pipes: (one from Mr. Vig), the Slow Smoke Competition Pipe from the International Contest from Cologne, Germany, guaranteed to have been smoked for only a mere 47 minutes - you can't get a fresher estate pipe than that!, and (from Hank Saatchi) an unsmoked 1950's era Kaywoodie Drinkless, complete with stinger. 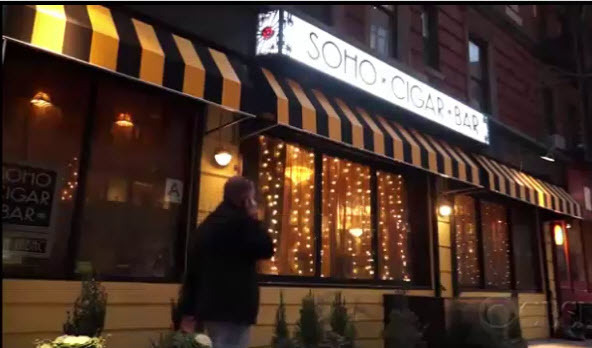 Afterwards, a number of us continued the celebration at our club meeting home, SoHo Cigar Bar, for continued smokes, fine eats and a nightcap or two! I want to personally thank the generous club members for donating the raffle prizes and thank all of those who came out to celebrate the special day. Don't miss out on next years celebration!!! Be on the lookout in our newsletter and Facebook page for this logo next February, it will alert you that our 9th Annual IPSD Celebration is imminent! Please be sure toto make plans to hoist a bowl with us in the name of International Unity and Pipe Smoking Brother and Sisterhood and join your New York Pipe Club next year as we look to celebrate our Ninth Annual International Pipe Smoking Day (IPSD) Celebration! As always, please be sure to check your email for our club newsletter and special announcements. Also, be sure to check in often at our Club Website and our Club Facebook page for all the details you will need about our club events as they become available. (a) All payments After February 20, 2015 – Check - $100.00; paypal $105.00. (b) All payments After February 20, 2015 Check $85.00 paypal - $89.00. Tell a friend and See you at the show! Mark Your Calendars and Check Back Often!!! Please be sure to visit our website's News and Articles sections for some new and important messages such as the announcement of the returnto the shelves of our NYPC NY State of Mind Tobacco Collection, the NY Daily News Feature Article about the NY Pipe Club, the NY Pipe Club Annual Picnic-BBQ, the NYPC's "Smoke on the Water", outdoor smokes gatherings on the Hudson and East Rivers, the NY Pipe Show, and the December Holiday "Kaywoodie Event".As always, please see the NEWS section on our club website and visit our Club's Facebook page for breaking news and important updates and details. Please be sure to visit our website’s News and Articles sections for some new and important messages such as the announcement of this Saturday's NY Pipe Show (Newark) on March 7th!!! When visiting our Club website, be sure you log in with you user name and password so that you can unlock the "members only" features such as our Members Photo Gallery! 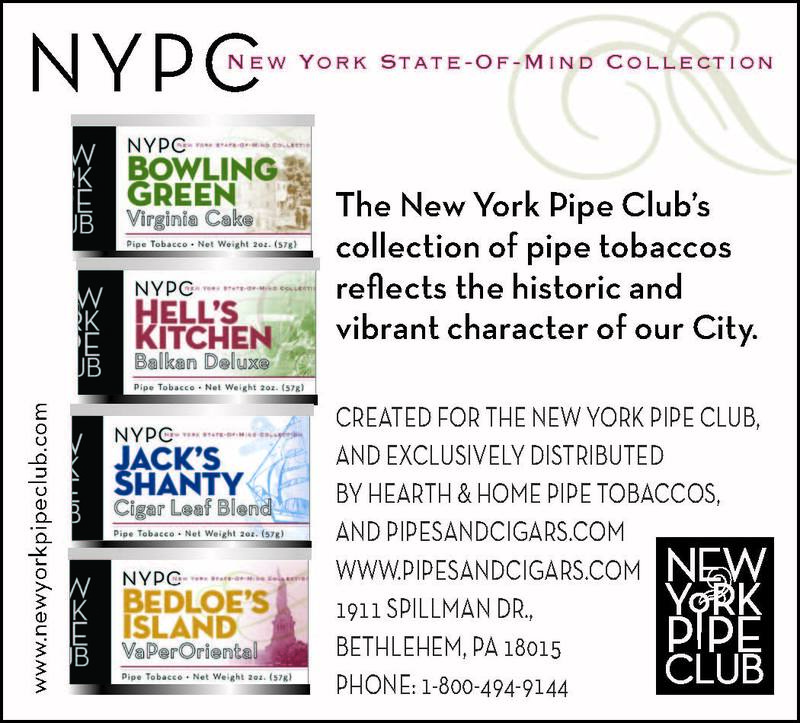 The NYPC's "NY State of Mind Collection"
BIG NEWS ABOUT OUR NYPC TOBACCO BLENDS!!! The New York Pipe Club's collection of pipe tobaccos reflects the historic and vibrant character of our City. Therefore, it would only make sense that they be available for sale in our fair City! Announcing!!! 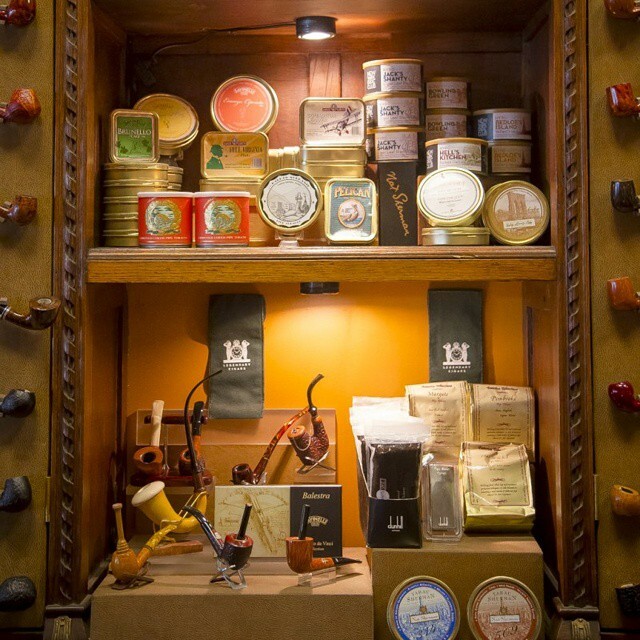 The NY Pipe Club's" NY State of Mind Collection" of fine tinned pipe tobaccos are on the shelves and available for sale, for the first time, at Nat Sherman, International, 42nd Street, just off 5th Ave., in NYC. A huge THANK YOU goes out to our good friends Chris McGrath, Pat Felitti and all our friends at Nat Sherman for making this possible! You heard me right, all four of our storied blends ARE and, at the time of this newsletter, stocked and available, for the first time for sale, NOW at Nat Sherman, International, our home tobacconist, and local B&M right here in mid-town Manhattan. See the photo below and in the PHOTOS section for photos of our tins on the shelves at Nat Sherman in NYC! Kudos and thanks to our own talented, Dan Silverstone, creator of our beautiful tin labels, who has worked hard to convert our tin labels to fit the new tin format, now that Sutliff, under the direction of our great friend and club blend creator, master blender extraordinaire, Russ Ouellette, is driving production. On that note, we are also anticipating having our blends tinned in the popular round Euro-style tins. Stay tuned for more info on that as the story develops! And, remember at some point in the future, we can consider expanding our NYPC "NY State of Mind Collection" series to new and interesting blends yet to come! I look forward to seeing them on the shelves and in a briar, meerschaum or corn cob bowl near you!!! Thanks again to our friends at Nat Sherman for making this possible, we appreciate it!!! ATTENTION, ATTENTION!!! - Exciting Club News! I would ask that you please keep our dear friend and member, Z. Kriz in your thoughts and prayers. Z is continuing to undergo treatment and is dealing with a lengthy recovery. Raise a bowl to Z! I was happy to hear from our own venerable Mr. Vig, who was glad to report that he had a very splendid day with our buddy Z Kriz recently. Z moved from Cobble Hill to a beautiful block in the Bay Ridge section of Brooklyn and Vernon met up with him for lunch. As per Vernon, Z is doing very well and sends his best regards to the gang and he misses us all, as we do miss him! All the best to Z, and we hope to see him back with us soon! Here is a photo from that day! Recently, I had the privilege of meeting Z for coffee at a very quaint French Bistro in the Cobble Hill neighborhood in which he lives. He is doing well, staying positive and fighting the good fight. He asked me to send a huge "Hello" to the club and to say that he misses sharing smokes with us. He also asked me to pass along his sincerest thanks for sending the get well cards and well wishes which we have sent him over the past year. Z hopes that someday soon he will be able to surprise us at a meeting. Until then, please keep Z in your thoughts and prayers and as always, when you light your bowl, be sure to raise it to Z! My heart-felt THANK YOU goes out to all of you for your generosity throughout 2014 and I look forward to seeing you at our monthly meetings and sharing many bowls with you through 2015! Come on out to the meeting this Tues. and join us in keeping the bowl lit! All are welcome! A LIGHTER WAS FOUND AT THE 2014 IPSD CELEBRATION AT NAT SHERMAN'S. IF YOU THINK YOU LOST A LIGHTER, PLEASE CONTACT LOU. but Not To Be Forgotten...! Visits our NY Pipe Club! Our NY Pipe Club had the distinct privilege of welcoming a distinguished guest at our May 2014 meeting: Cornelius Crans and his wonderful wife. Cornelius is the President of the CIPC - Comite International of Pipe Smoker Clubs, who, thanks to our own Mr. Vernon Vig, made a stop over in our fair City after attending the 2014 Chicago Pipe Show. NY Pipe Club Article in NY's Daily News!!! Great Press for the Club and the Hobby!!! Please join me in thanking NY Daily News writer, Jason Silverstein, for his feature article highlighting our NY Pipe Club! 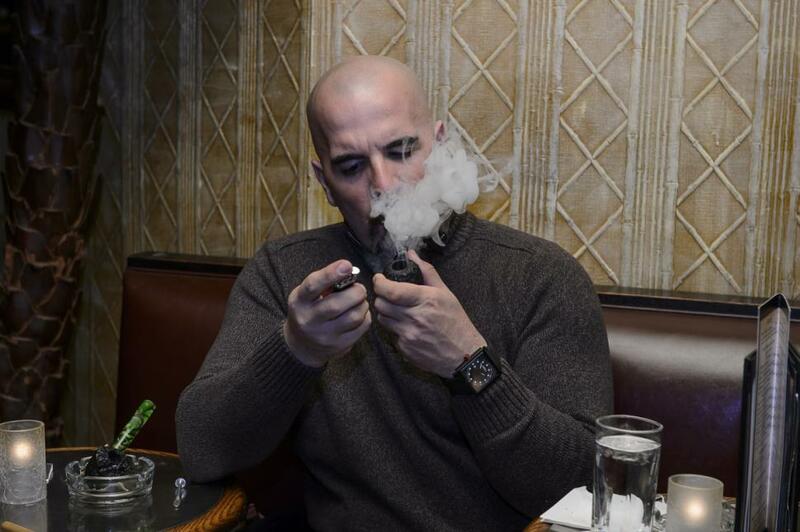 The New York Pipe Club has enjoyed some great press as a feature article debuted in Monday, May 5, 2014 NY Daily News! Thank you, Jason Silverstein, feature article writer for the New York Daily News, who had the fantastic idea of writing an article about the renewed interest in Pipe Smoking in our fair City. 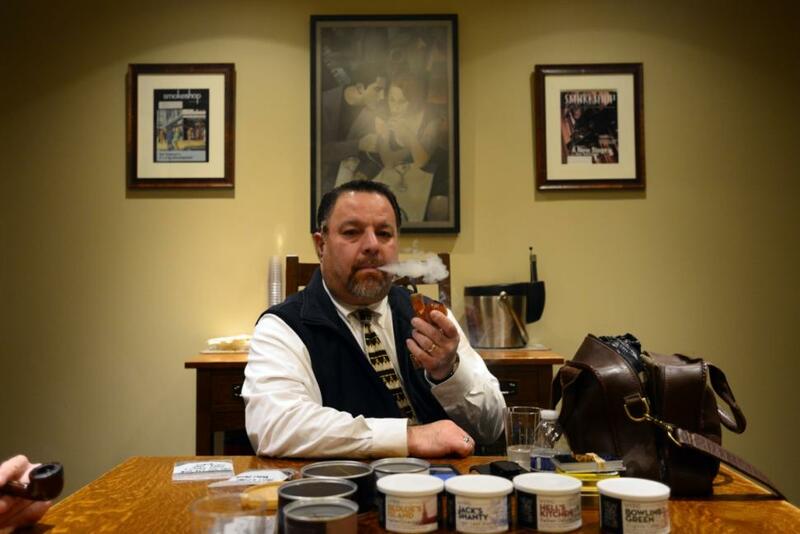 He took the opportunity to highlight our Club and our wonderful pipe tobacco blends! Thank you, Jason for your article featuring our New York Pipe Club, our wonderful pipe tobacco blends and our great city! I also would like to thank Russ Oullette, Dan Silverstone, Bill Roberts and of course Chris McGrath and Pat Felitti of Nat Sherman Tobacconist for all of your cooperation and assistance in making this article possible! Thanks also go out to all of our Club members for their cooperation with the photographer as well as being so willing to be interviewed by Jason when they both visited us at our March Monthly Meeting, I appreciate it guys! I enjoyed working with you Jason and hope that you find the time to join us in the future. Just a quick word to let you know that all four of our storied blends are NOW re-stocked and available for sale at NYPC Tobacco Blends at www.pipesandcigars.com. As many of you know, if you have attempted to order at least two of our wonderful NYPC Tinned Tobacco Blends from pipesandcigars.com in the last 9 months or more you would have found that they have been continually out of stock which was cause for much frustration. Our dear friend and master blender of our tinned tobaccos, Russ Oulette, has worked very hard to meet the demand for the blends however, due to his new role and ever expanding responsibilities with pipesandcigars.com, it became increasingly difficult for him to sufficiently meet that demand and supplies have suffered. This is especially true of the two pressed Virginia blends which are the most time consuming to produce. After some valuable input, advice and suggestions from many of our own NYPC members, upon having opportunity to sample the Sutliff versions, Russ has communicated our recommended adjustments to Sutliff and as a result, 192 tins of each blend were produced. The resulting inventory is back on the shelves NOW at www.pipesandcigars.com!!! With Sutliff driving production, we can be now assured that our blends will be continuously available.It will also help keep the royalties coming in to help fund club activities and tobacco tastings. Our own Dan Silverstone, creator of our beautiful tin labels, has worked with Russ to convert our tin labels to fit the new tin format. On that note, we are also exploring the possibility of having our blends tinned in the popular round Euro-style tins. Stay tuned for more info on that as the story develops! We are also in discussion about having our blends be made available via other internet tobacco sales sources in addition to pipesandcigars.com, which would open up sales to a greater degree. And finally, we are also discussing having our blends be made available in bulk form. I am positive all this will work out perfectly for us, as it has for many of Russ' own blends, as well as other Pipe Club's and their tinned blends, which he created and are now produced by Sutliff. This solution will enable Russ, via Sutliff, to supply the demand for our wonderful NYPC tinned blends on a continuous basis. Again to reiterate, most importantly to me in all of this is that, like Russ’ blends, our own NYPC Blends, will be made to Russ’ exacting specifications in every way. That means using the exact same leaf quality, production processes and strict adherence to the recipes that we as a club, along with Russ, have worked so hard to achieve over a number of years. The only noticeable changes will be the tins (containers themselves - and some great news regarding them will be revealed soon - like utilizing the round Euro-style vacuum sealed tins -) and the thickness of the cake slices, as they (Sutliff) have the capacity to cut them thinner for easier prep – which is a good thing in my opinion. And, remember at some point in the future, with Sutliff driving production, we can consider expanding our NYPC "NY State of Mind" series to new and interesting blends yet to come! I am sure that we will be satisfied with the Sutliff versions and I look forward to seeing them back on the shelves and in a briar, meerschaum or corn cob bowl near you!!! "Folks, here's my latest blog post writing about International Pipe Smoking Day. Link to pictures provided so you can see the lovely member's only lounge they provided for our usage." ***You may have heard that pipesandcigars.com was purchased recently by Cigars International, a Pennsylvania based retailer and one of the biggest on the planet. Well have no fear, our blends are still under the blending prowess of our dear friend and "brother" Russ Oulette, who is now with the retailer in Bethlehem, PA. So, not only are our blends still in the best hands they can be, the best part is that NY State residents have a reprieve from the 75% tobacco tax because the shipping originates from PA. So, stock up on those blends now! You can read all about the sale of pipesandcigars.com at the following link courtesy of our friend, Kevin Godbee and pipesmagazine.com. BTW, our buddy Scott from Habana Smoke Shop, the brick and mortar arm of pipesandcigars.com, still owns the shop so if fate ever finds you in or around the Albany, NY area, please be sure to stop in and say hello! Now back to our blends...! As you may have heard, thanks to good friend, Russ Oulette, our own series of four tinned tobacco blends, the NY State of Mind Collection, made their proud debut exclusively on our good friend, Kevin Godbee's informative pipesmagazine.com website and "in the tins" at the 2012 Chicagoland Pipe and Tobaccianna Show on May 5th and 6th, compliments of pipesandcigars.com, where our blends were extremely well received by all! Many thanks go out to Scotty and the gang at pipesandcigars.com, exclusive distributors of our blends, who had a ton of samples which were given away to all. With our four blend variety, there was something to please almost any taste! We've also received additional print exposure in the April 2013 edition of The Pipe Collector Newsletter, published by the North American Society of Pipe Collectors, as a colorful history of the process in developing our blends is scheduled to appear. Our own very talented and beloved member, Bill (E. Roberts) takes the reader on the epic journey from humble beginnings of trial and error samples to ultimately - perfection in a tin - all 4 of them! Bill has written a masterful tale that you will not want to miss. Not only does it include the story of the inception and development history of our blends but also notes some of the high points of our club's long and storied history, written as only Bill can. You may already know that Bill writes periodically for our friend, Kevin Godbee's website,pipesmagazine.com, who has already published a number of Bill's works, including the exclusive report and review of our wonderful club blends, plus much, much more, just look for him there under, E. Roberts. Thank You, Bill for your time and talents on behalf of our club, we appreciate your work! ...and if you missed the April 2013 edition, why not order a back copy! As I have been telling you, our club blends currently enjoy favorable and positive reviews in the Fall 2012 Issue of Pipes & Tobaccos Magazine's Trial by Fire section on fine tobaccos. Tobacco tasting connoisseurs Tad Gage and Joe Harb have been reviewing blends for P&T Magazine for years. 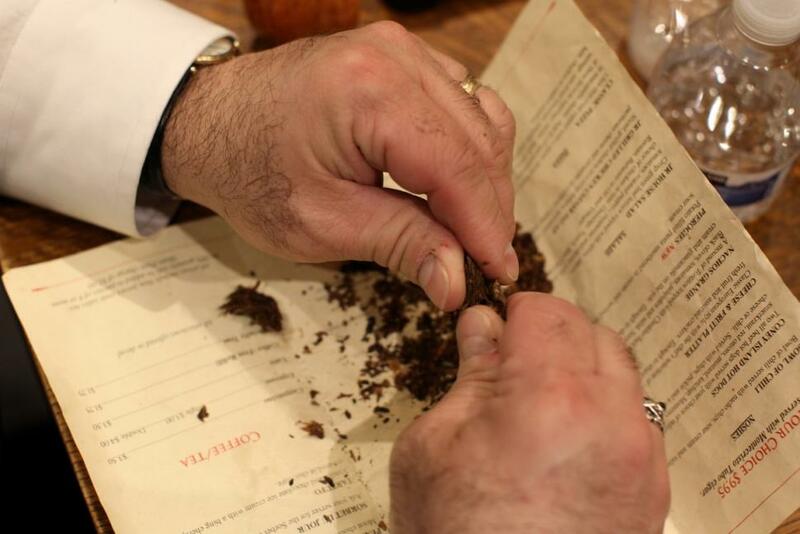 Tad Gage is a blender of fine tobaccos and Joe Harb was a judge at the 2012 Chicago Show's John Cotton Throwdown. Both are well versed in critiquing tobacco blends of all types and their opinions are of the most respected in the hobby. I am overjoyed, to say the least especially knowing how hard we all worked on achieving the finished product, that our 4 blends received extremely positive and favorable reviews from both of these gentlemen - and of course, I concur!!! (LOL!!!) But seriously, both Mr. Gage and Mr. Harb enjoyed sampling our blends, loved the artwork - I kid you not, at the 2012 Chicago Show in which our blends debuted, I had requests from pipe smokers who wanted to buy the tins for the artwork alone - I am so proud of that, let alone the blends themselves, and both commented that they would love to revisit the blends after they have put some age on the tins. So this is fantastic news for our blends! Pick yourself up a back-copy of the Fall 2012 Issue at your local tobacconist or order one from the link listed below. And... If you are currently not a subscriber to this fine publication you should really consider taking out a subscription and lend them your support. If you are a subscriber to this fine publication then you will already know that the club has placed a quarter page ad which appeared, appropriately, in the "Trial By Fire" tobacco review section in theWinter 2013 Issue. A follow up ad also appears in the Spring 2014 issue. Here is a copy of our ad, and once again, THANK YOU, to club member Dan Silverstone for lending your expertise in graphical arts for the benefit of our club, we appreciate it! Our New Club Logo Goes Fashion Forward!!! I'd like to share with you a cool way for you to sport our new NY Pipe Club logo. New York Pipe Clubware Site! Along with the NYPC logo T-shirt, in an assortment of vibrant and tobacco colors and the NYPC logo white Golf/Polo shirt, we also have the trendy, 'iPipe' shirt,the never out of style 'Vintage Blends' T-shirts, the classic NYPC logo Baseball Cap, and 2 different NYPC 1" buttons! Check the site for newly added items that you will want to add to your pipe wardrobe! NOTE: If you tend to get excited wearing our clubware and set fire to your clothing, you may want to cellar some extras in various colors. A percentage of the profits go directly to our club, so break-in a t-shirt, tamp down a 1" button, pack a cap and have a bowl with your new attire. As always, we will also take individual orders for our Embroidered Line of fine shirts and hats, from a different vendor, just let us know what you would like and we will try to accommodate the order as minimum orders do apply. New York Pipe Club Pins Back In Stock! That's right, thanks to the tireless efforts of beloved members Peter Guss and Dan Silverstone, our new Club Logo Pins are finally in stock, look incredibly great and are ready to be worn on your lapel, as a tie tack, on your NY Pipe Clubware cap or anywhere else you would like to pin them. The pins are 1"x1" and look exactly like the logo below. They turned out unbelievably great! If I had a dollar for every time I was asked for a NY Pipe Club pin at the Chicago Show I'd be able to buy myself a Bo Nordh pipe! At a cost of only $5.00 each, get yours while they last! Contact or see Lou at the next meeting to get yours! FYI... Food For Thought... I am sure you are well aware of the change in our relationship with Florio's while we were meeting there. Effective with our February 2010 meeting, a $10 per person cover charge was imposed to use the upstairs cigar lounge. Payment of this fee enabled us to continue to use the lounge for our monthly meetings andwas collected by the waitress when you entered thelounge. The fee was for use of the cigar lounge only and did not go to the waitress. Please note that the main complaint from Florio's management was that the waitress was not sufficiently compensated (tipped) for her service, so please, especially now that we are meeting at a new location, let us heed this message at our new venue, SoHo Cigar Bar and I urge you to please tip accordingly as you settle your food and drink tab at the end of the evening. It will go a long way towards securing our invitation to return. 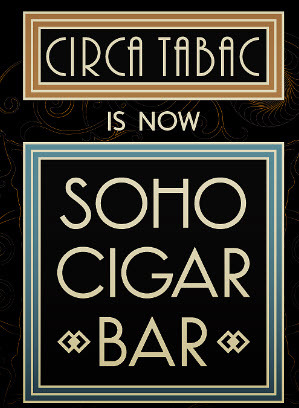 SoHo Cigar Bar has made every effort to ensure our comfort so let's please remember to tip accordingly. I want to take this moment to thank you for giving me the opportunity to serve as your next President. No one could ever replicate the contribution of Mr. Vernon Vig or the legacy that he has left; however, it is my intention to be the leader and friend as he was during his tenure. I know I speak for all of us in thanking him for the devotion and dedication that he has shown for our club. It is my hope and intention to continue along the path that has been forged and I will commit to promote a vibrant and enthusiastic environment and to help promote and spread the joy of our hobby. But, I need and would appreciate your help. A club is only as successful in proportion to the involvement of its members. I encourage you to get involved. Speak to me about your ideas on how we can make the club even better than it is right now. I will listen and do my best to help make our club an enjoyable and comfortable place for all. As always, stay well and happy smoking - and I'll see you at the next meeting! For further details please see links included in this newsletter. We are sometimes asked for email addresses of fellow club members. You can find that out yourself from the Member Directory, but you must sign-on to the web page. This information is for your eyes only and is restricted to current club members. Click "Member Login" on the upper right corner of the screen; if you have forgotten how to log on, the system will show you how to recover your ID and/or password.